WASHINGTON, DC -- The U.S. military is considering training regular members of the Ukrainian Army starting in late November, the Pentagon said Monday. Lt. Gen. Ben Hodges, the U.S. Army's Europe commander, said the program, if approved, would be the second phase of training Ukraine forces and would involve Army units under the country’s Ministry of Defense. Ukraine has been in a years-long civil uprising that included residents ousting their pro-Moscow president in 2014 and has since resulted in continued fighting with the new, pro-democracy government trying to quell separatist fighters backed by Russian forces. Moscow, in the immediate aftermath of last year’s change in power, took control of Ukraine’s eastern peninsula of Crimea, which borders Russia. Right now, the U.S. Army has 300 soldiers in western Ukraine training Ukrainian National Guard units. 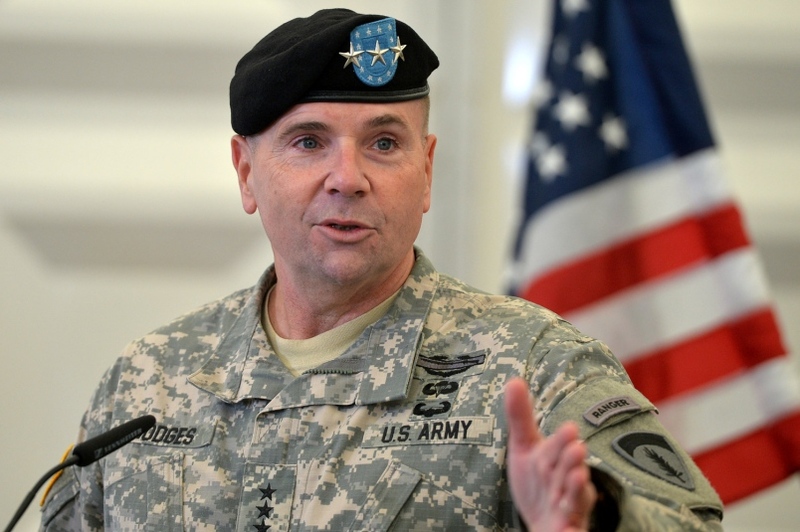 The U.S. military is not providing lethal arms to the forces, and Hodges said there are no immediate plans to change the policy. Last week on Capitol Hill, Defense Secretary Ashton Carter and the next chairman of the Joint Chiefs, Marine Gen. Joe Dunford, said they supported providing lethal arms to Ukraine. Hodges also said the Russians would like a land bridge to Crimea but would first need to take over the Ukrainian port city of Mariupol -- a situation that has U.S. officials on alert. He also pointed out the swiftness with which the Russians invaded Crimea. However, Hodges said he could not provide evidence that a land-bridge operation was imminent and suggested rebel forces still didn’t have enough “capabilities” in place -- including air power. He cited recent acts of terrorism inside Ukraine including “booby traps” and IEDs, or improvised explosive devices, similar those found in Iraq traceable to Russians. “It would be hard to believe that most of the attacks are not known or tolerated” by the Russians, he added.